This must be how it feels to see a unicorn. Six months ago, I came face to face with a machine I’d read about often but never expected to see. A one-off invention, this oddity had been a dreamlike presence in my life, hovering into my consciousness at unexpected moments, something I imagined but couldn’t fully sketch in my mind. I’d dreamed of it since I was ten, a time when I was obsessing over a cassette tape my dad had given me. On it were some electronic sounds he’d recorded from the radio – sound pieces composed by the BBC Radiophonic Workshop. I was already playing music by the age of ten – reading the dots as I lolloped my way through the odd score. And unusually for a girl in the 70s, I was quite the inventor. Rather than conforming to stereotype and tucking my dolls up in bed, I was tying them into ski lifts (cardboard boxes) and winching them across the garden using Meccano and string. My sister Jenny and I had annexed my poor old dad’s record collection and were recording excerpts, fading them in and out and adding voiceovers to create imaginary radio plays about trips to the Moon. So you could say this Radiophonic tape came at a good time – a moment when I was beginning to experiment with sound. One of the most memorable pieces from the Workshop at that time was an adaptation of a Ray Bradbury Play ‘There Will Come Soft Rains’ (I think it was created by Malcolm Clarke). The sounds on the Radiophonic tape blew me away, more than Bowie’s Space Oddity or the synths in Roxy Music, more than the other-wordly reverb in my dad’s old rock n’ roll records, more than that cheesy number Popcorn. So I eagerly searched for more information. At this point, I was out of luck. I’d have to wait another thirty years for Google. In the late 1970s, the only musical resources at the disposal of a ten-year-old electronica freak in Watford were the singles department in WH Smiths and the Grove’s Dictionary of Music and Musicians, a dusty old behemoth of an encyclopaedia that filled an entire shelf of the reference library. Despite the promise of the cover (a whole volume just for R and some of S), I don’t recall anything on the Radiophonic Workshop, except for a couple of lines (which may not have been under ‘Radiophonic’ at all but in ‘Synthesizers’ or ‘Electronic Music’). And there was a photo, so small and grainy, the details were lost in the dots of the printing ink. In it, a woman was hunched over a machine. We were looking over her shoulder – and the machine, I thought, was on a table. This was a synthesizer, we were told. 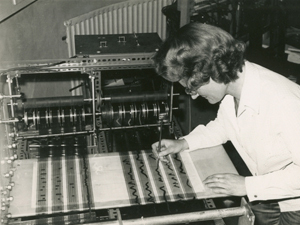 And its inventor was Daphne Oram, a woman who was creating sounds by drawing them on her machine. On Ada Lovelace Day, I want to remember the moment I saw that photo. I may have been sitting in the Watford Library, but I felt like the explorer who had glimpsed a sailor’s sketches of a marvellous creature from a far off land. Something unexpected and utterly alien had been presented to me – and the picture was fragmentary and devoid of any reference points that could help me comprehend it. Unlike the synths on Top of the Pops, the machine in this photo didn’t look anything like an organ. It was something other. And it was being played by its inventor, a woman. A tiny photo – but it was enough to fire my imagination. This was a snapshot of an extraordinary world that I would never find in the pages of Grove’s (at least in the 1970s). By the time I was a teenager, I wanted that world more than anything but didn’t have a clue how to get there – all I could do was write my own music with conventional instruments. But it’s no surprise that this discovery, coupled with the sounds of the Radiophonic Workshop, kick started a lifelong obsession with electronics and the physics of sound. At eighteen, rather than audition for music college, I signed up for an engineering degree: electroacoustics. I studied engineering because I wanted to be an electronic musician who could design her own instruments, just like Oram. I have never looked back. With her machine, Oram was devising a means of synthesizing and sequencing sounds from scratch. In some respects, her machine comes from the tradition of European experimentalists who were creating sounds by drawing on celluloid film. Although there are some family resemblances between Oram’s machine and the layout of today’s virtual sequencers, to this day, her machine is like no other. The history of the machine is very well documented, for instance on this Goldsmith’s website and this great article in Sound on Sound. Very briefly: it dates back to the mid-1950s when Oram was working for the BBC as a ‘music balancer’. As soon as she was promoted to studio manager, Oram campaigned for the BBC to open its own European-style experimental music department. This would use electronics and magnetic tape to create new sounds, often by manipulating and splicing together the sounds of ordinary objects – an approach to composition known as musique concrète. Oram teamed up with Desmond Briscoe, a colleague who shared her interests, and the pair set to work in 1957, making experimental sounds using oscillators, tape splicers and other borrowed equipment. They persuaded the BBC to open a Radiophonic Workshop to continue these experiments in 1958. When Oram left the Workshop in 1958, just three months after it opened (I’m not sure if this was her own decision or down to curious BBC staffing policies), she set up an independent studio in Kent. Here, she composed more electronic sounds, for theatre, film, advertising jingles and for her own experimentation. She also thought about drawing waveforms and envelopes on film, then scanning them in with a machine (an idea that had also been interesting engineers at RCA). And in the early 1960s, with some funding from the Gulbenkian Foundation, she embarked on building a machine to realise these ideas – the invention we now call the Oramics Machine. The machine would require some sophisticated electronics so in 1965, she brought in Graham Wrench, a former RAF radar engineer, to design and build the electronic image scanner. (Steve Marshall has written a fascinating article on Graham Wrench’s contribution to the project). The result was a machine which could generate sounds, using waveforms drawn on glass, then manipulate their pitch, timbre and other attributes, using envelopes drawn on clear, celluloid film. This machine would have been extraordinary even if it had never played a note – a thought experiment about sound, distilled in celluloid, paint, metal, electronics and string. But work it did and Oram was a fine composer. Although I didn’t join the dots at the time, Oram’s influences on my decisions to study electroacoustics were two-fold. She was co-founder of the Radiophonic Workshop, the extraordinary laboratory somewhere in the BBC that had fired my imagination. And she’d devised the mysterious machine I’d seen in that tiny photo and couldn’t get out of my head. Fast forward to March 2011 and Tim Boon, chief curator, called me up from the Science Museum. Mick Grierson from Goldsmiths College, London, has found something remarkable in a barn in France and the Science Museum had been hard at work on its conservation. Mick and I had met at Dorkbot London (a get together for ‘people doing strange things with electricity’) so I knew he shared my passion for early electronica. And the find in the shed? The Oramics Machine, more or less intact after three decades lying dormant, in an exhibition and now in this old barn. Tim asked if I’d be interested in viewing the machine and talking about Oram’s legacy – the BBC were covering the story and wanted a contribution from a woman who worked with electronics and sound. I said yes, of course. So in early April, Tim ushered a few of us into the storeroom in West London. Thirty years after seeing that grainy photograph, I was face to face with the Oramics Machine, my unicorn. A site so arresting, I had to make an excuse to go behind a cabinet while I shed a tear. You can see Mick extracting the Oramics Machine from the barn in this short documentary by Nick Street. The machine is now on display in the Science Museum, London. Ada Lovelace Day celebrates inspirational women in technology and science. The website Finding Ada have asked women working with technology around the world to say a few words about another woman who has inspired them. There are many women to choose from – I could, for instance, have written about the fine electroacoustic composers Delia Derbyshire or Eliane Radigue. But following my visit to the Science Museum stores this year, I wanted to write about Oram. Apologies to any aficionados for any inaccuracies in Oram’s biography – I’m not an expert on Oram’s life and work but hope you find this an interesting read.